The Montefiore Einstein partnership distinguishes itself through its commitment to research and community outreach, as well as patient and physician education. Our philosophy of patient care is fundamentally holistic in nature, with our primary goal to restore patients' overall functional health. All team members take a personalized approach to patient care by individualizing the experience and making it as warm, intimate and comforting as possible. The team takes extraordinary steps to create a support system that makes patients and their families feel at home. Many types of special liaisons are available for support. Among the multiethnic, multilingual staff, patients often find speakers of their native languages. Translators are also available on the premises. We have developed a robust relationship with the Orthodox Jewish community and offer many special services, including a separate waiting lounge with kosher food. Accommodations for the needs of other ethnic groups are willingly met. Transplant patients highly value the fact that all aspects of pre-and post-transplant care, as well as the transplant procedure itself, are coordinated and performed by attending transplant physicians or specialists. Patients are supported at every stage by a team of nurses, social workers, donor advocates, nutritionists and financial counselors, who, by working together, create a unique transplant experience. 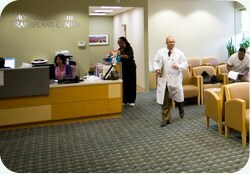 All abdominal transplant patients at Montefiore stay on a state-of-the-art, newly renovated unit. The unit is staffed by physician assistants and nurses who work solely with transplant patients and are familiar with their needs and desires, as well as the warning signs of complications. Montefiore's outpatient facility for transplant patients provides a single location where patients may see a specialist, transplant surgeon, dietitian and social worker and have blood tests done. Centralizing services for this unique group of patients facilitates education and dialogue, reduces patient stress and helps ensure coordination of care. We are available at any time to discuss general surgical issues. Urgent cases requiring surgical or medical consultation often can be accommodated the same day. We are happy to discuss the timing of a referral with you by phone. Even if a patient is not a candidate for transplantation, we are available to see the patient in our office to discuss treatment options. After the patient has been examined, we will send you a letter detailing our recommendations and follow up with a phone call to discuss the case. Our full-time physician liaison can work with your office staff to expedite and facilitate referrals to our practice. Liaisons will provide you with timely feedback on the status of our patients.